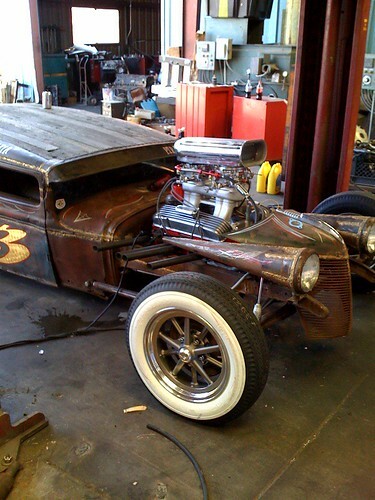 Home/Car Stories/Indy 500 Driver Owns Rat Rod! When you tune into the Indy 500 this weekend and see all those beautiful race cars going around the historic Indianapolis Motor Speedway remember that at least one of these guys is a real car guy; not just a racer. Paul Tracy (PT) is a car guy and a real racer. If you live in Las Vegas you may have already seen PT cruise around at car shows in Sin City but for the rest of you check out our Feature Car page for an update on the wild Rat Rod. PT purchased this car a couple of months ago and was busy making modifications and making it all his. Then the phone rang; some papers were signed; a gecko jumped onto the hood of an IRL car and PT was off to Indy. On the first day of qualifying he was the fastest by over a mph. He has now qualified 13th for the 2009 500. If you didn’t see the 2002 race or don’t remember it or if you think Helio won it watch this video. If you don’t have a favorite for the 500 then root for PT, the Rat Rod Car Guy!!!!!! !